The Vanderbilt Commodores’ losing streak reached 13 games after being beaten by the Auburn Tigers 64-53 on Saturday afternoon. The Commodores, sporting a David Williams “DW” patch on their uniforms in memory of their beloved former Athletic Director, lost a relatively low-scoring game as they shot an abysmal 33.3% from the field, while holding Auburn to 34.7% overall. Auburn players showed their toughness early, playing intense man defense in half court from the start, while also pressing and picking up their matchups full court throughout most of the game. They also displayed their energy on the offensive side of the ball, playing a more fast-paced game than Vanderbilt; they were more aggressive, they drove to the hoop more, and they ran their plays more smoothly. While they did improve towards the end of the first half, the Commodore players seemed slower and more lackadaisical in the beginning. Despite all this, Vanderbilt led 20-17 with 3:28 left in the first half as their defense held Auburn to only four for 22 shooting in the first 16 minutes. Unfortunately, the Tigers found their rhythm in those final minutes, scoring 10 of their 27 first half points. Despite their best defensive half in SEC play, the Commodores offense failed them as only freshman Aaron Nesmith was effective, accounting for 12 of the team’s 23 points. The second half was a similar story to the first. Early on, it was a more physical game and the referees were, once again, harshly booed for their performance by the hometown crowd, especially after calling two straight arguable offensive fouls that hurt the Commodores. One was on Matthew Moyer after scoring, and the other was on Nesmith while on a fast break. Auburn’s squad was able to separate itself and hold a six to eight point lead most of the second half, but Vanderbilt came back every time to make it a four point game – despite their offense stagnating for several plays in the middle of the half -, until the Tigers would, again, extend the lead. The most painful of these was late in the game when Vanderbilt, after clawing their way back 53-49, let Auburn to hit two quick layups. They once again got within four points with less than two minutes left, only for Malik Dunbar to hit a three-pointer with 1:33 left that all but ended the Commodores’ chances of coming back. 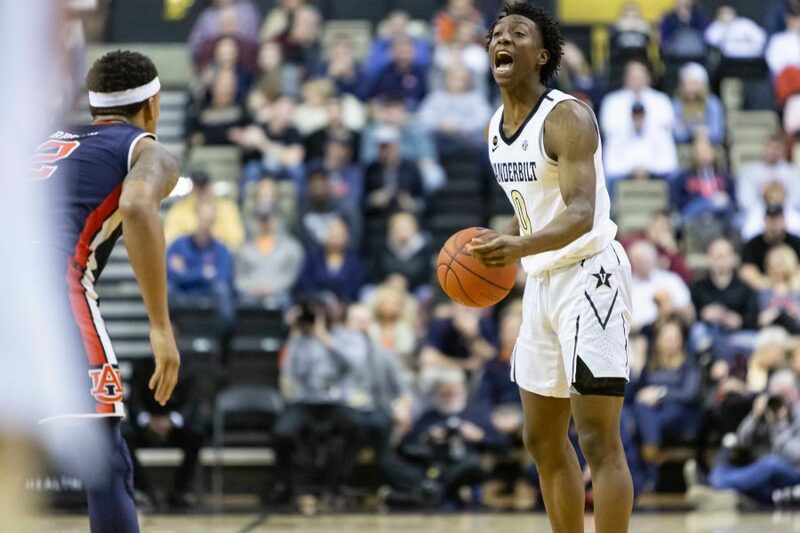 While Vanderbilt’s freshman star in Nesmith had arguably his best game yet finishing with 24 points and 14 rebounds, Auburn’s guard duo of Jared Harper and Bryce Brown troubled the Commodores with 19 of their 30 combined points coming in the second half. On the other hand, Vanderbilt Head Coach Bryce Drew, and players Nesmith and Yanni Wetzell, preached a similar message to the one they have given the last few losses. Recognizing another tough loss, Drew pointed out that they reached all their statistical goals today (except for their turnover target), considering that an important positive. Fan favorite Nesmith will only win over more fans after being asked if it was hard to keep playing and being up during the squad’s losing streak and responding that it was not. “If you love the game of basketball, you’re gonna get up for every game and play,” he said. That is exactly what all Commodore fans hope for.